Moment of madness mars lower league game between Castel San Niccolò and Fortis Arezzo. Watch the crazy moment a player kicks the referee for sending him off in an Italian lower league match, only for the referee to stare him down. 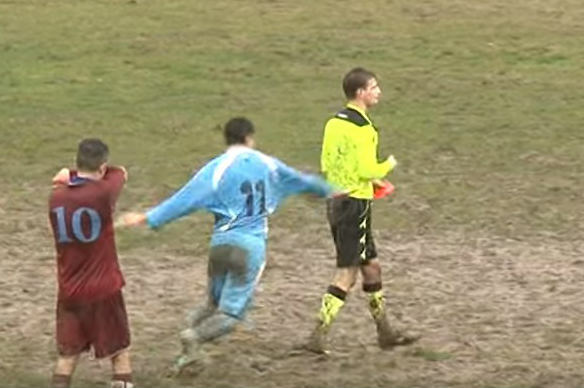 The Terza Categoria match between Castel San Niccolò and Fortis Arezzo descended into farce when the player who’d received his marching orders lashed out violently at the ref once his back was turned. It’s an attack that looks like it would floor most people, but this particular official doesn’t just keep his footing – he stands his ground and stares down the player while his team-mates rush over to restrain him. A cautionary tale then for any player who kicks the ref – he might just turn around and make you look like even more of a chump than you already are.